Excel can return a value randomly based on its probability by using SUM, MATCH and RAND functions. 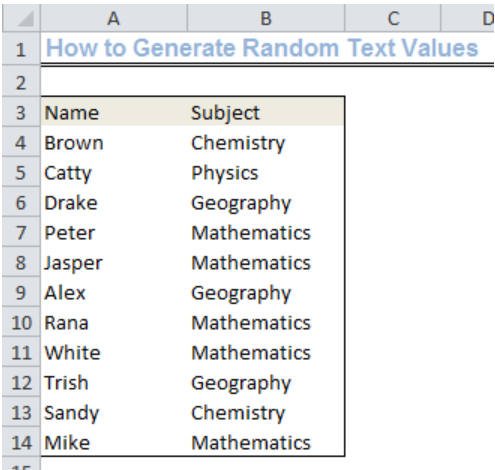 This step by step tutorial will assist all levels of Excel users in randomly creating a list of values based on their probability of being selected. Note: This will only work if the data is numbered in sequence with the number of values available. Therefore, if this was five rows of data, the values would have to be 1, 2, 3, 4 and 5 in ascending order. For other types of data, we will need to use the INDEX function explained later in the article. *The previous series of steps were used to illustrate how the match function looks up data. In the next series of steps we will generate multiple random values in column E by adding RAND to our MATCH formula to generate a more dynamic matching function. The RAND function returns a random value between 0 and 1. We will use the RAND function to develop the random lookup. I need help creating a formula. Consist of 3 data points. 2 are weighted 35% and 1 is weighted 30%. The 2 weighted at 35% the value can range from 0% to 100%. The 1 weighted 30% the value range is 0%-11% but the lower the number the better. Example 0%=100% of the 30%weighted, if that makes sense. Problem 2: Suppose we are simulating a matchup between CO and NYY. We generate a random number between 0 and 1 and compare it to the win probability. If we randomly generate 0.45, is our conclusion that CO won or lost?